Summer is here and that means it’s not too soon to begin getting ready for the holidays. AccuQuilt has just released a new Studio Santa Stocking die for the Studio 2 Fabric Cutter, and I’m in love with it. I have made Christmas stockings in the past, but never have I made Christmas stockings so quickly and easily. These stockings are not only beautiful, they are big enough to actually hold lots of goodies. This tutorial will take you through the process of making a beautiful stocking. The design options are endless. These stockings can be decorated with hand or machine stitching. 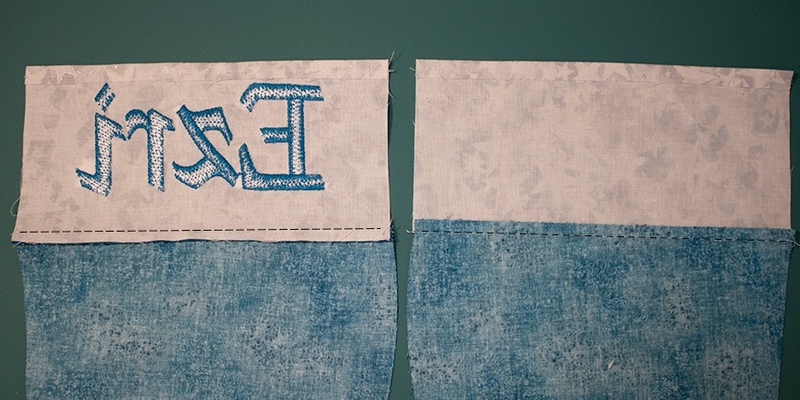 Another fun option is to stitch together some orphan quilt blocks or make a patchwork of squares as shown above. Cut them quickly and easily with the Studio Santa Stocking die and you have a lovely patchwork stocking. Another fun idea would be to make crazy quilt blocks using the new Studio Crazy Quilt die, stitch the blocks together and cut with the stocking die. The cuffs can be made of any fabric such as Minkee, velvet, corduroy and others, and they can be personalized with name embroidery. Another idea for the cuff would be to use half of an orphan quilt block (6" would work best) and seam the straight edge of the block to the top of the stocking. In the photos above, the cuff was made with two jelly roll strips that were then cut with the die. The ways to make these are limited only by your imagination. Fabric: ½ yard of fabric will make two complete stockings, and 5½" x width of fabric (WOF) will make two complete cuffs. Step 1: Cut the stockings. Two complete stockings can be cut from one 40-42" width of fabric. However, the fabric must be placed on the die according to the following diagram. Because of the overlap, the stocking must be cut and then the fabric turned to cut the second stocking. Step 2: Hem the cuffs. Before hemming the cuff, add any decorative stitching that you want. I used the embroidery machine to stitch names onto the cuff. For machine embroidery, the cuff was secured to a tearaway stabilizer using a spray adhesive. The cuff was centered in the embroidery hoop and the names were stitched directly onto the cuff. To hem the cuff, fold the wrong side of the fabric down ⅜" and press. Top stitch across each cuff ⅛" to ¼" from the edge. NOTE: I added dashed lines to the photo to show the stitching as the white thread on white fabric did not show well. Step 3: Stitch the cuffs to the stockings. Place the lower edge of the cuff and the upper edge of the front of the stocking with right sides together. Stitch a ¼" seam. 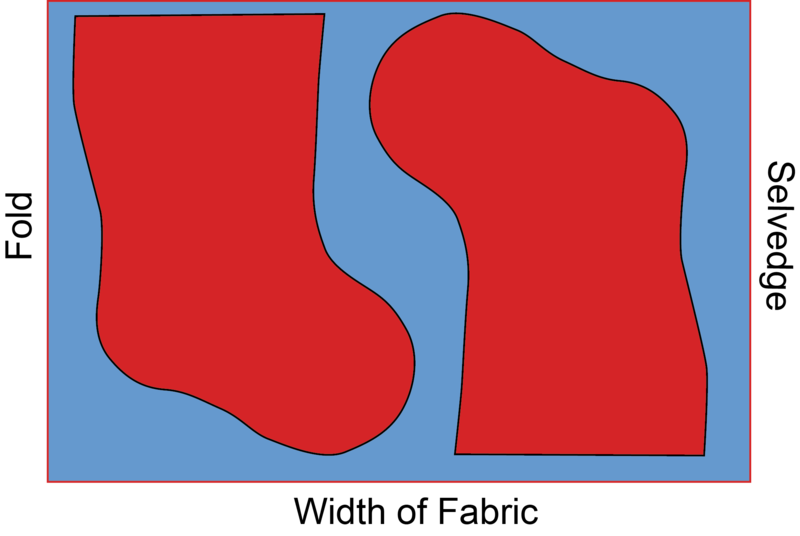 Press seam to one side. Repeat this for the back of the stocking and press the seam in the opposite direction. Tip: If using patchwork for the front of the stocking, cut a matching stocking from muslin or quilting cotton and place that over the patchwork before stitching together. The muslin/patchwork will be treated as a single layer for the front of the stocking. This will prevent the patchwork from fraying and will create a smooth interior for the stocking. Step 4: Stitch the stockings together. Lay stocking out on a flat surface and pin the stocking with right sides together. Match the upper edge of each stocking and pin. Match the cuff seams, interlocking them with one side pressed up and one side pressed down and pin. Match the remaining edges of the stocking and pin as needed. Because curves are being sewn, it is very helpful to have the two pieces of the stocking secured with pins. Stitch the stocking together. Backstitch at the beginning and end at the edge of the cuff. Use a smaller stitch (2.0 mm) and stitch a ¼" seam slowly and steadily around the curves to create rounded and smooth seams. After stitching, gently clip curves approximately ⅜" to ½" apart to release seam allowance when the stocking is turned right side out. Take care when clipping curves not to clip the stitches but to clip only the fabric of the seam allowance. Step 5: Turn and press and add hanger. Turn stocking right side out. Use a smooth edge like the rounded end of a point turner or other tool to smooth the seams all the way around. Using your fingers gently roll the edges and press carefully making sure all seams are rounded and smooth. Make a hanger of self fabric or use a ribbon as I did. Stitch the hanger inside the top edge of the cuff.